With a merry, mini tree in its handlebar basket, this personalized Bike with Tree ornament is a holiday hit with kids of all ages—delivering personalized cheer, year after year! Our 3-D Christmas ornament is detailed all around, fun from every angle, and only found here. We'll personalize with name and any year, creating a cherished Christmas keepsake. Specify name; limit 1 line, 10 letters/spaces. Specify year; limit 4 characters. Resin. Personalized ornament measures 4 1/2" long x 1/2" wide X 2 3/4" high. More than happy with all the ornaments I purchased. Great quality. This ornament is exactly as described and pictured in the catalog. It is unique and will be enjoyed for many years by the 3 year old it's going to. Biking is Grandson's #1 passion right now! because we are taking our family on a biking trip and wanted something fun as a reminder. 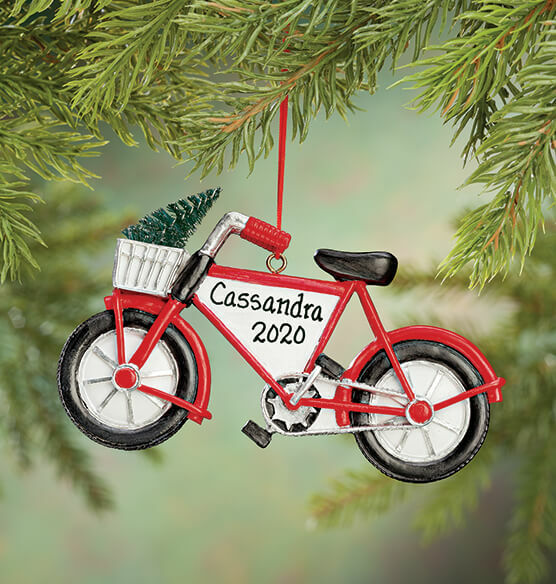 cutest bike ornament i found online that can be personalized. Perfect ornament for 10 year old boy! This is the only child's bicycle ornament I could find online. Looks the best. Nice looking and reasonable price.